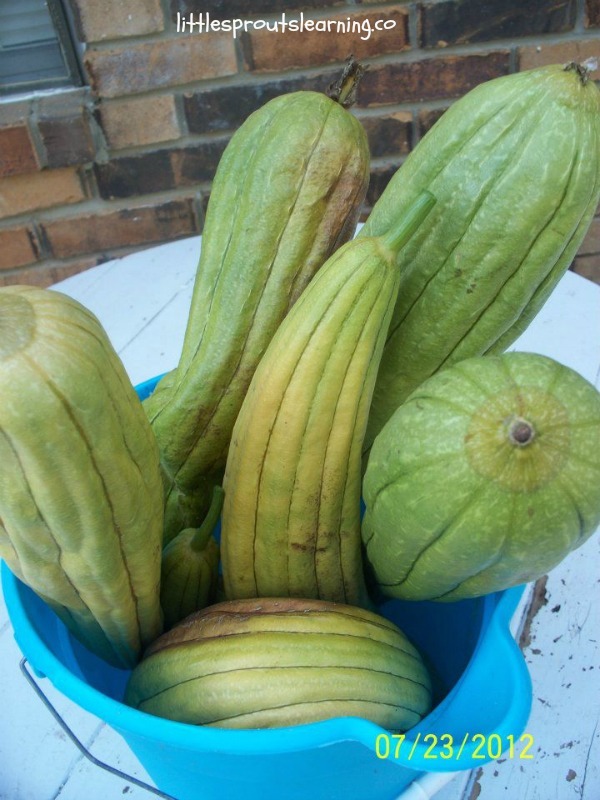 Did you know you can grow your own luffa in your garden? 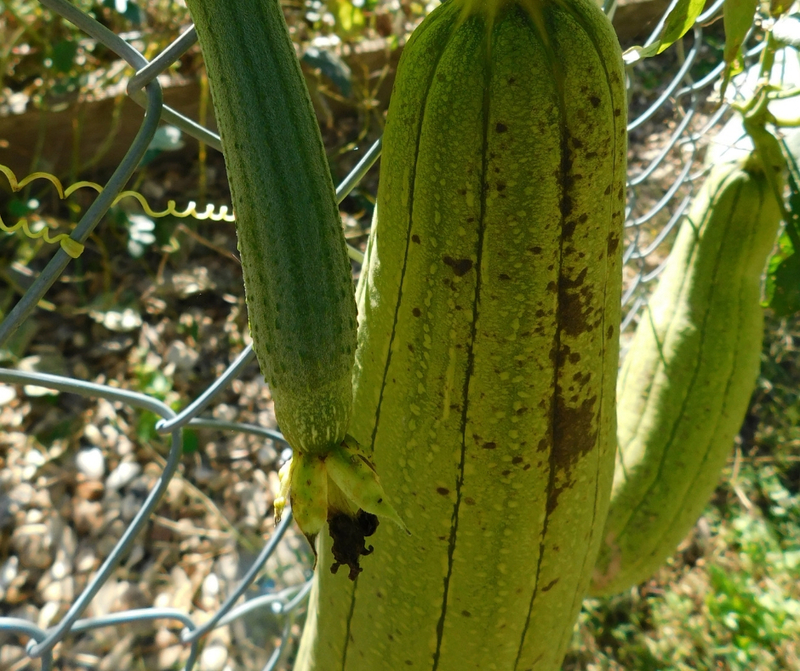 Luffa sponge plants are actually a gourd! 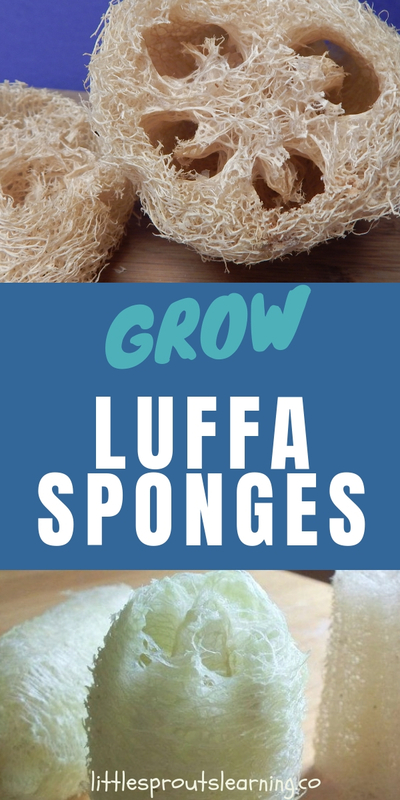 Luffa growing is so much fun and it’s easy too! How to grow and use loofah sponges and where to buy them. Luffa sponges are useful for the body, home, and are even edible. During the gardening with kids class I took to learn how to grow food with kids, one of the speakers brought some luffa seeds to give us. She told us about how she grew them with her children and let us each take a few. I was so excited and took a couple of the seeds and set out to grow my own luffas. What an exciting adventure! You can get some luffa seeds that the Little Sprouts harvested from their own luffas here. Remember, they are hard to germinate, so expect some not to. We grow a large percentage of the food my family and my home daycare kids eat right here in the garden, WITH the preschoolers. If you want to find out how our gardening got real around here, click here. Subscribe to our mailing list so you won’t miss a thing. Giveaways, information and anything else we have to offer. The first step in growing luffas is to plant your seeds. The season for growing luffas is extremely long, so you need to expect to start your seeds extremely early and grow them indoors under a light sort of like a houseplant. You could even grow them in your greenhouse. Click here for instructions to build your own. In Oklahoma, I start mine in January and set them in the ground outside around April 15 or early May. Plant the seeds about a half inch deep and water well. Luffa seeds are hard to germinate, so if you take some time and soak them in water for about 24 hours, they may sprout more easily for you. They need to grow a foot long or more before you plant them in the ground. It can take anywhere from a week to two months for them to sprout. The ones we planted two years ago took 6 weeks to germinate, and the ones we planted this year took one week. Be prepared to be patient. Once you get past this stage, you can grow luffa as long as you have heat. 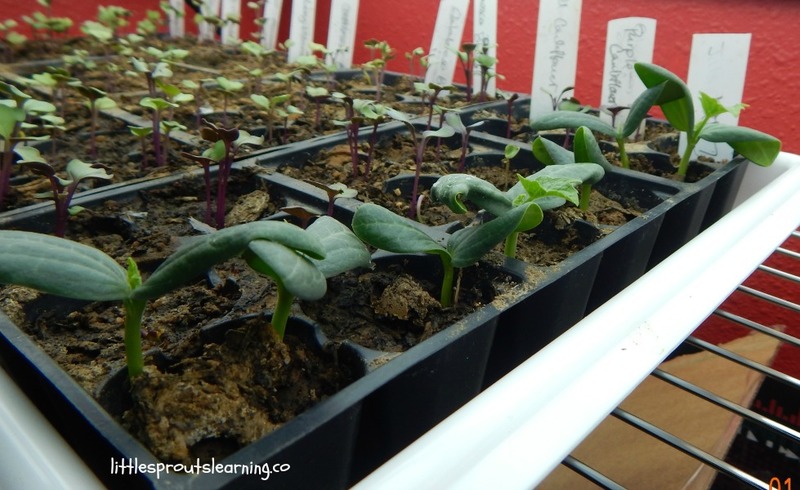 Here are our luffa sprouts two weeks after germination. Once your plants are about a foot long and all danger of frost has passed, plant them in the ground. I have found over the past 6 years that when I plant them in my hard clay soil, they do better than when I plant them in healthy loam with lots of compost. That’s our experience. 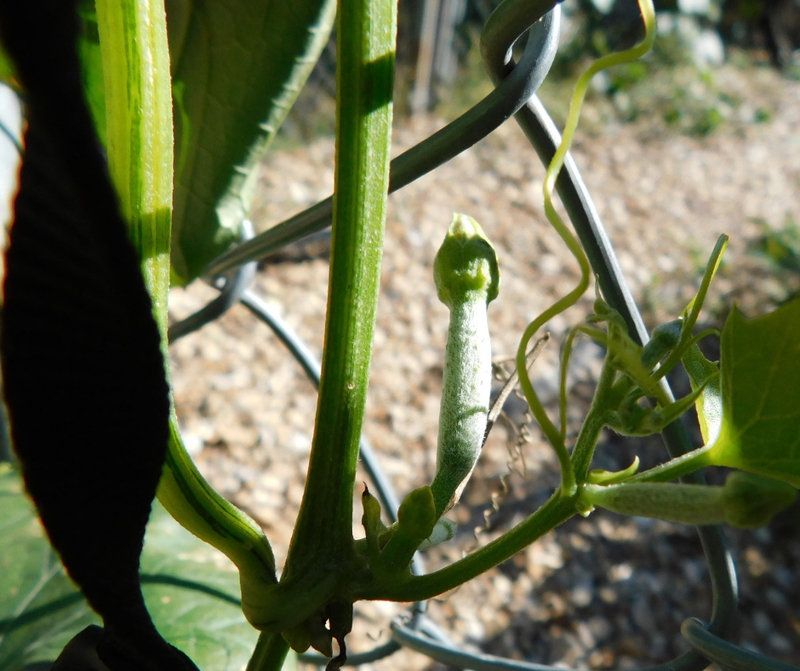 You can grow luffa in whatever kind of soil you wish, but in my experience, they like to have little care. How much room do luffa sponge gourd plants need to grow? 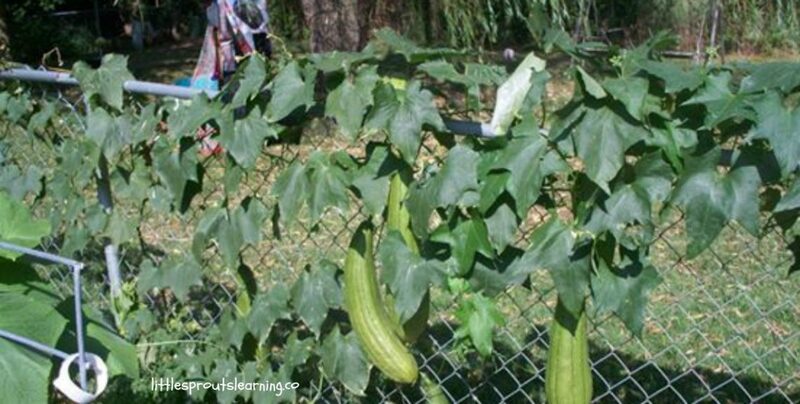 Luffa vines will grow to around 30 feet long and need a strong trellis to grow on so be prepared to give them a sturdy home. We grow ours on our chain link fence. Luffa gourds also need 8 or more hours of sunlight a day to form the blooms and gourds. The vine will flower and behind the flowers, the tiny luffas will start growing and continue to grow into a large gourd around a foot long. 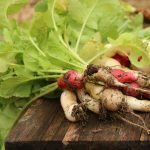 More information on how to build raised beds, build a trellis for your plants, and basic gardening information you need is available here in these beginning gardening videos. Click here for more information. You can even download a tour of what types of beds we have in our preschool gardens for free. For information on how to grow an easy garden, click here. If you’re interested in the Back to Eden gardening method, click here. Once the luffas begin to turn yellow, they are ready to pick. You can wait until they turn brown to harvest them, but it will leave dark spots on the luffas, so if you want them to look nice and light, harvest them when they are yellow. 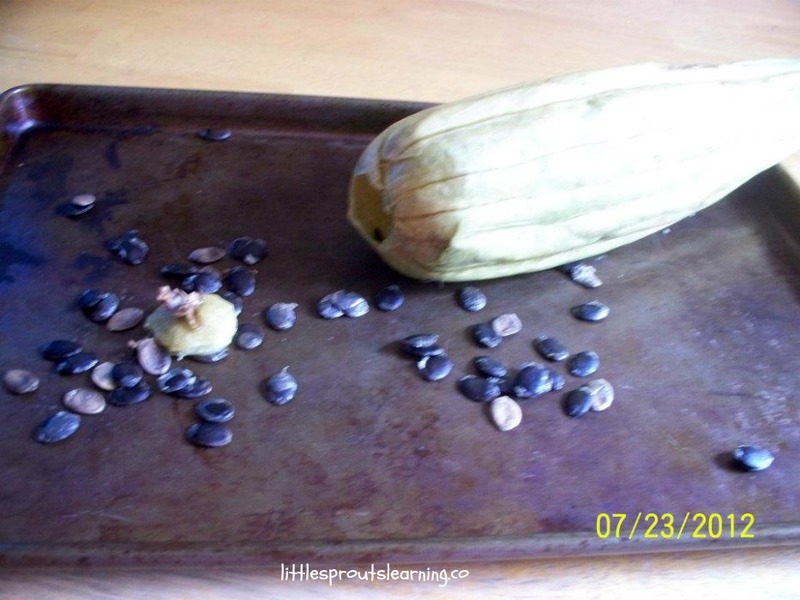 As soon as you harvest them, pull the end of the gourd off and shake the luffa seeds out. Each luffa makes an inordinate amount of seeds, so it will take some work to get them all out. If you want to save the seeds and grow them again or share them, you can just leave them to dry on a paper towel for a week or two. Package them in an airtight container and store them in a cool, dry place. The luffa seeds I germinated this year are ones I saved two years ago and all of them sprouted, so they store well. When you get most of the seeds out of the luffa, you can pull the peels off the sponge. They are very fibrous. It takes a little work to get them started, but once you do, most of the peel usually comes off in one piece. You’ll end up with a big pile of thick skins, they can just go into the compost. The luffas are covered with a slimy wet substance that you can just rinse off. Once they are clean and seed free, you can let them dry and store them in a dust free location. They will last for years. The first time we grew luffa gourds, we had three vines and ended up with almost 100 luffas. It was great fun and we use them for many uses. You can cut luffa into smaller pieces so they are easier to use. They will cut with scissors but it’s hard to do, the best way is to cut the luffa with a serrated knife. I use a bread knife and it cuts them like butter. How long will loofah’s last? As long as it’s not sitting in water, one luffa will last for several months or even up to a year! For more information on how to care for your luffa, click here. Luffas are great exfoliators for your skin. I keep one hanging in the shower. I have sensitive skin and I use my luffa in the bath with Tom’s natural soap. You can exfoliate with it a few times a week or you can use it as a washcloth and wash your whole body with it. You can even make luffa soap, click on the link to find out how easy it is. Luffas are great for washing the car or scrubbing dishes as well. The possibilities are endless. Click here to see more ways to use the luffas you grow. 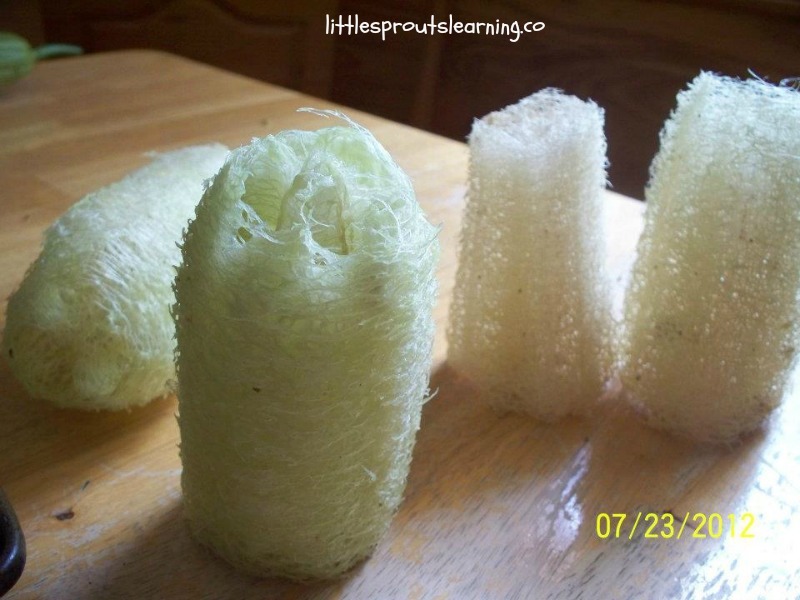 Growing luffa is a unique and interesting experience. The kids loved taking them home to their parents and we also did a Mom’s pampering party with them. Check out some of our Mom’s Night Out parties here. I have given them as gifts to many different people as well. This project was one of the favorites with the kids. They were enamored at how huge the vines grew and the funny looking fruits luffas that grew on them. 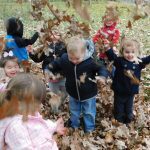 Kids learn so much by growing things click on the link to find out more. I hope you will try to grow luffa. Tell me about the most unusual thing you have enjoyed growing. Seeds are available here. Thanks so much for reading. How to grow tomatoes, how to grow Brussels sprouts, how to grow okra, how to grow hot and sweet peppers, how to grow cabbage, how to grow kohlrabi and how to grow sweet potatoes. Also, how to grow potatoes, how to grow dried beans, how to grow luffas, how to grow birdhouse gourds, how to grow cotton, how to grow sunflowers, how to grow Jerusalem artichokes and how to grow wheat. What an interesting post about Luffas. I do love this plant a lot. Other than harvesting its mature fruits for their sponges, I do like to harvest them early for their deliciously edible fruits. Recently, I have sown some few-years-old luffa seeds direct onto the soil in my garden but they have not germinated yet the last time I checked on them. I hope at least one will come to life so that I can have its vine cover up my whole backyard fence to screen off my back neighbour’s house while able to enjoy its fruits in many ways. Thank you! I’m so interested in how you enjoy eating them. I have tried them raw but that’s it. The seeds take a while to germinate. Don’t give up! I hope you get some. Oh, you are welcome! I just add a little water ( very little – as this sponge gourds are already very watery ) + a small spoon of grapeseed oil + a little salt. Then, I cooked them under small fire and that’s it. They have a kind of taste I don’t know how to describe. But, that just taste great to me. Perhaps its because I am not fussy when it comes to eating. Some people said these gourds are very cold in nature, so we cannot eat them every day. Once a week would be fine though. And thank you so much for your encouragement. Previously, I paid for and harvested the fresh gourds from my neighbour’s garden. She has a lot of them. Actually, this is the first time I try to grow and sow the seeds on my own. It is from your writing that I come to know that they could take quite some time to germinate. I have actually almost given up on hope that they will ever germinate. Now I have renewed Hope. Thanks again! Have a great weekend! You too, thank you so much! I grew some luffas a few years ago, and yes, they take a long time to germinate. I looked online, and found if you soak them overnight in water, clip the tips off with nail clippers, place them between damp/wetted paper towels in a ziplock bag and leave them in the oven with the light on, they germinate in about a week. Like you, I did this a while before seasonal weather allowed me to put them outside. By the time it was warm enough, most didn’t make it. Didnt know soaking and clipping would germinate so quickly. Will have to adjust my attempt next year. Great tip. I have tried soaking mine before and they ended up rotting, I need some more practice with this! Thanks for checking out the post. Hi Christina! I’m new to gardening but have planted some luffa seeds which have now sprouted. You said you had 3 vines which produced almost 100 luffas. Does one sprout = one vine once grown? I’m unsure how many to plant of the ones that have sprouted and how many to gift to others for them to plant! I have grown two types of loofah. Last year we grew Chinese loofah, which is longer and thinner, and even more prolific than the Egyptian loofah we are growing now. You are right about needing patience to grow them. I have developed quite a lecture about giving me grandchildren. The Chinese loofah blooms at night, and the pollinator s work overtime making the blossoms dance in the moonlight. The Egyptian loofah blooms in the day time, closing up shop when the sun goes down. The Chinese loofah would be beautiful in an arbor. How fun. Thanks for the information, so interesting. Do you use the Chinese loofah for scrubbing as well or is it only for eating? Thank you so very much! That is encouraging to hear. 🙂 Thank you for reading them. I love to grow the usual veggies and herbs, but also hot peppers. It’s so difficult to find organic hot peppers in the markets. I hope I win this giveaway. I hope you do too! I wish everyone could win. 🙂 Thanks for commenting. We love to grow unusual veggies and hot peppers too, we had a bumper crop of them this year. I love to grow anything edible–even flowers! Me too. FUN! We eat nastursiums. My always favourite is heritage tomatoes. I just love the flavour. But this year I also had a lot of fun with diakon. I’m always up to try something new… Which luffas would certainly be! Fun, i love tomatoes too. Seeing the different flavors you can get is so much fun! I love to grow all sorts of things … pretty flowers and ornamentals, all sorts of edibles … veggies, herbs and fruits. 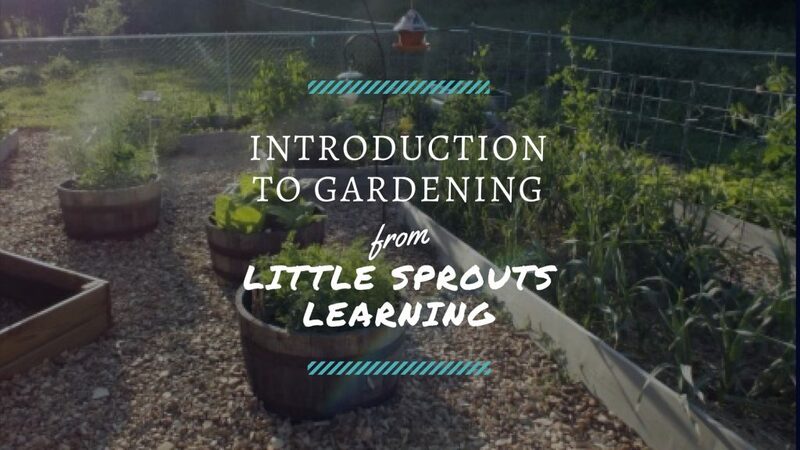 I’ve been gardening since I was a toddler … with my Dad then and now, with my kids … I LOVE sharing the miracle that is within each seed with kids and seeing the joy as the seeds they planted sprout and grow and become beautiful healthy plants! That is so the best part for me too! I love the miracle in there. I’m amazed every single time! Thanks for commenting! We like to do that too. Next year I plant to let the kids plant spoon gourds, last year we did cotton. It’s fun to learn about new things. We love to garden at Cribs To Crayons Childcare. We had lettuce, cucumbers, cherry tomatoes, carrots, green beans, peas, and broccoli this year. Next year we are adding blueberries, raspberries, blackberries, strawberries, pumpkins, squash, small watermelons, green peppers, luffas, and potatoes. Can’t wait! I never knew! Thanks for the info! Congrats on the milestone! Great ideas. Keep up the good work! Oh dear, what do I love to grow? If it grows, I love it! I’m excited to give loofahs another go next year. Tough in New England with the shorter season. I think my favorites, especially with kids are lemon cucumbers, heirloom tomatoes (the weirder the shape and color, the better!) and sunflowers! How fun! Maybe you can start them indoors in january and grow them inside for a while. I saw this article awhile back so we planted some this year. We planted about 10 seeds. Two came up and one survived. It covers the side of the chicken coop. We have so many gourds coming on. It has been such a fun experiment and we will continue to do it. I think we ordered fom an Heirloom seed company. I just asked my husband, “Where do you think loofahs come from?” He went, “…from a factory?” I’m with you, I always thought they were from the ocean, too. So we were both wrong (although him more than me, I’d like to think, hahah!) – thanks for including these great photos to dispel our crazy misconceptions! Ha ha, that’s great. Yes, i think he was more wrong than you. 😉 Thanks for checking out the post! This was so interesting. Thanks for all the information. This is way cool! I love the idea about using your fence to grow them on, would make a great vision barrier while growing. Did you pant in the ground at the base of your fence or in pots? I’m afraid my moles would disturb them in the ground , for some reasons they are super active under my fence. Going to jump on the loofa growing train! We have grown them in the ground and in raised beds along the fence, they did the best in the ground. Would you like to trade some seed for Trumpet flowers? I have some already rooted and you should not have any problem with them. I enjoy them very much. The first year they may not bloom. In the winter I just mulch and they come back starting in the spring. Okay who knew there were so many different kinds of luffa seeds…..and they vary hugely in price. What are the best ones to use (& reasonably priced)? I like the ones from renees seeds, but i love buying from them. The link is in the post. Thanks for asking. A friend of mine gave me some seeds. I can’t wait to get started growing them. This is new to me. I had no idea that this was even a possibility to grow. Is there a certain time of year that is best to start? How long does it take, beginning the seeds to picking the gourds? It depends on where you live, what the growing season is, but get them started asap, they take a long time to grow. Check out the article, it tells about that. Thanks so much for checking it out. I’m excited you are growing them. I live in oklahoma, and we start ours in february and get them in the ground around may 15, then we harvest until freeze in fall. We usually start harvesting around june or so. They are also very delicious when cooked when they are young. We make savoury and sweet dishes from them in Indian cooking. They sure are! I have eaten them raw, but haven’t tried them cooked. How lucky you are to have a friend give you some seeds. If you have a couple extra, I’d love to have some to try. Good luck with your planting. This is a perfect post. A friend actually gifted me some loofah seeds, but I didn’t know what to do with them, so this is great! Thank you! Oh, they are so much fun! Enjoy! Thanks for reading. Sorry I didn’t see your reply. Thanks . I have the vines and the flowers growing but I have ants under the flowers. I do not see any sponges growing. Can you advise me on what the problem is. The sponges will start to grow after the flowers start, so be patient, it’s coming. The ants shouldn’t bother the luffas, i have ants all over mine and luffas are starting to grow on them. 🙂 Don’t give up! If you have any seeds left, I would love to have some. It would be fun to grow some luffa’s with the grandchildren. It sure would, i hope you get to. We don’t have any seeds left here, but there’s a link in the post that leads to where you can get some. Happy growing and thanks for reading! Hi Cindy, I don’t know how often you check your comments. I accidentally left my address on my previous comment. I would appreciate if you could delete it once read. Thank you. Hi Tara! I went ahead and deleted your previous comment so your address wouldn’t be on my blog. I wanted to make sure I’d be able to remove it because Cindy won’t be able to. 🙂 You could recommend to her and just leave your email address if you’d like, then you could email her your home address. Thanks for reading the luffa post, I hope you get some seeds from her. Havea wonderful day! Hi, this is actually a beloved vegetable in China. You pick them when they are still young and green, slice it in to 1cm thickness, fired it with garlic and eggs and oyster sauce… Wonderful summer dish that is short on calories and full of fibre and vitamins. The texture of the young gourd is crisp and delicious. So I think it is really a pity to miss it as food. That’s so cool! Thanks so much for sharing it! We did try them raw and they were yummy. I didn’t cook any of them though. We were excited to grow the sponges, so we didn’t want to eat too many. Thank you for reading and for your comment! Whhhaaat? I didn’t even know this was possible. New project! Right? It’s so fun! 🙂 Thanks for checking it out! They are scratchy like a scrubbie that you get in the bath section of the store, that’s where i have seen them. They stay scratchy like that, they are great for exfoliating. They are like a bunch of strings all wound together, so over time they break down and get flat, but they are still scratchy. It takes about 6 months to wear one out. Thanks for asking. I sliced them about 1.5″, and bought glycerine soap at Michaels, added scent and color, put the slices in the bottom of red party cups, poured the soap on top. I wrapped them in lace, tied them with ribbon. They made a great Christmas gift! Everyone loved them! That’s a GREAT idea! We got tons, but some other people I know that have grown them did not, so I’m not sure what the magic touch is? Thanks so much for reading! These for so fun to grow and harvest! They make my skin so soft and now that I’ve used them, I can hardly go back to a regular rag. They also are great for scrubbing the unscrubbable on dishes. I’m glad you are enjoying growing them! They are great, aren’t they? I germinate all my seeds in peat pots placed in trays in my kitchen oven with the light kept on. You just have to keep an eye on them as they will germinate quickly and you have to remove them asap or they will grow rapidly and leggy. This is so interesting I would love to give it a try. I live in southern fl. & would love to have some seeds would be willing to buy them or help on how I can get some. Thanks so much for any help you can supply. Thanx so much for your quick response. I looked it up and I found that burpee seeds has them so I bought some. I’ll look foward to contacting you again in the future. God bless! Great! So glad you found some. Happy Growing! Thanks for reading. I know luffa seeds are available at park seed online and maybe baker creek. I hope you find some. Happy growing! Hi ! This seems amazing ! I don’t think we have those in France ! I would love to have some seeds and more Infos ! Have a perfect day ! This is very interesting. Would LOVE if you could send some seeds. Have many knitting projects and seeds of many different veggies if you are willing to trade. Please email me at christacole23@gmail.com. Hope your day is fabulous!! How do you clean the luffas after doing dishes? Just handwash on its own? I clean the luffas by just rinsing them like I would a rag or regular scrubber, then if they get extra yucky, I run them through the washer or dishwasher. If they don’t come clean enough from that, I just compost them and get out a new one. If you have a few spare seeds… fastype77 @ yahoo(.com)… or know where to purchase, let me know. Thank you! I have plenty of seeds & love to share. Been growing for years…Note: white seeds aren’t mature & will not grow…only plant black seeds…give me info & I’ll send any of you a few seeds untill supply is gone…maybe u have something to exchange? I have thousands from this summer .. 1 luffa can yield 75+ seeds. I would LOVE to grow luffas. I can send you a SASE. I could crochet a green and white cotton wash/dish cloth. Some people love them, some people…aw, not so much. ? I would love some seeds if you would be willing to send some to me, I would really appreciate it. Feel free to email me at mmrealestateagent@gmail.com and I will send you my address. Thank you in advance! Hey. I would love some seeds! My family has a tradition where each of us endeavor to learn one new skill per year that would help in an emergency/life altering situation. I’ve always wanted to teach everyone how to grow and use these instead of artificial sponges, but I could never find seeds in my area. I’d really appreciate it if you could send me some. I know loofa long time ago , we use it in Lebanon , and we call it lifa ,Greeks call it loofa . We used to use also natural sponges , they become rare later but I know that Greece sea is rich with it . I live now in Quebec Canada , we have loufas in stores , I tried to plant their seeds it didn’t work . I appreciate if some body send me some seeds to grow , our Sumer here is short , so we need to prepare it before , best regards to all . I would love some seeds. Send me your address and I’ll send you an envelope. Thanks so much…. I would also love a couple of seeds, and would happily pay postage. Are there different varieties of luffas, and is there a chance that one variety of luffa will overgrow my area? Should I be looking for a particular type of luffa, that is? I live in NC, and invasive species tend to be problematic. I would love to have some seeds. Let me know what you’d like for me to do. If you have any black seeds left I would just love a few , thank you so much !!!! Hi Cindy I would like to have some of the luffa seed. I will appreciate it . I also have some other seed I can share. I can send you paid envelope. Would love to grow luffa. Will swap with whatwever I have. How about spaghetti pumpkin? Or spaghetti beans? or flowers. Whatever you like. Please reply. Or anybody else with exquisit growing. I would love to grow Luffas in addition to my slowly growing small farm. My husband and I love our farm and I tried my first garden last year. Learned a LOT of what to do and what not to do, gotta learn somehow I guess. But I never knew that a puffs was a gourd, for some reason I thought it was a man-made item. I apologize that I don’t have much to offer in return for a few seeds. I crochet in my free time so if there is something you could use I would be more than happy to make it. Also, if you have any helpful tips on when to plant, what works best for growing, I would appreciate it very much. My email is Heather.pennington1987@gmail..com. Will you please mail me some seeds? I grew an abundant display of Morning Glories this year and I’d be more than happy to send you some seeds from them. They were a wide variety of colors and the plants were very healthy as I’m sure the seeds will be. I would love some seeds if still available! Thanks for the tip! I would love to try to grow these. My skin could use some attention, it has taken a beating from chemo. Cancer was three years ago but medication has made my skin feel rough. I think luffas will help. I love to grow anything I can. Thank you so much for any seeds you may be able to spare. I’m sorry, but I don’t have any seeds left to give you. 🙁 There is a link in the post to renees seed if you would like to purchase some. I wish I had enough for everyone! Thank you for reading. I know you’d love the luffas if you grow some. Cindy- i just came across this thread. if you have any seeds, i would love a few. can’t wait to try my hand at growing luffa’s. Clearly I am not one of the first 8, but I would love to get some seeds. I don’t even know where to begin to look for them locally. Do you know if they will grow in any region? The weirdest thing I ever grew was a trumpet squash. I live in Northern Utah. I have been told you can grow them in northern areas if you start them 12 weeks before your last frost date indoors. This way they get a jump on the season. You can find the seeds online at Park seed or Baker Creek Heirloom seeds as well. Thanks for checking it out. I don’t know if anyone mentioned it before that luffa can be eaten when they are young. They are very delicious. I tried a few of them raw, they were good. 🙂 thanks for checking out the article. I put my seeds directly into the ground without any problems. I also read elsewhere to let them dry on the vine. I just checked mine and discovered a few that were ready and they came out beautiful! 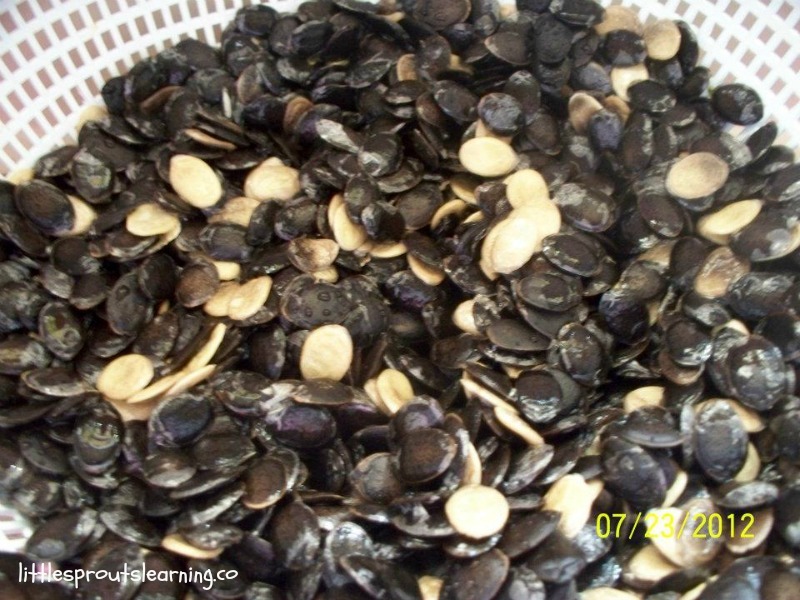 I tapped and squeezed them to release all the seeds, broke open the bottom end to dump the seeds out and then easily flaked off the dried outer shell. Just beautiful. One of the most fun things we’ve ever grown! Where could I purchase seeds to grow luffas in New England? From what I have read, since luffas need such a long growing season, they cannot be grow too far north, BUT I have had other readers say they grow them up there, so I would try it if I were you! 🙂 Park seed sells them and I think Baker Creek Heirloom seeds does also. Check out their websites. And GOOD LUCK! I hope you get to grow some! I always thought Luffas came from the sea. I would love to grow these in my 2016 garden. I’m always looking for different with a purpose/use. Luffa would be perfect. The most unique thing I have grown to date was black oil sunflowers. They actually turn their heads and leaves to follow the sun, facing east in the morning and west at sunset. Creepy but fascinating all the same. We had a plot about 40 feet deep by 65 feet wide. It was like they danced with the sun all day and bowed their heads at night to sleep. ? Those sound super cool! Thanks for reading and for sharing! It is interesting that they are edible but I guess other foods are good younger too and become tough and inedible if left growing too long. Luffas are super interesting to grow. Thanks for reading! no, i’m sorry, I don’t have any more to give out. There are several places that sell them including park seed online. I hope you grow them, it’s great fun! I actually harvested my seeds from a farmers market vendor who grew his own and we bought some from them and I saved the seeds from ours since he didn’t use chemicals on them to clean them, so check out local farmers markets where there are local/organic farmers or soap maker vendors!! I am starting mine late so I’ll see if they do very well fingers crossed I’ll get some out of them!! Thanks for the post I can’t wait to plant these with my son tomorrow! How fun! And what a great learning experience for your son! Thanks for reading! I love this idea.. I so want to try it with my kids do u know where I can get seeds?? Several seed companies have them, Park Seed online is one of them. There are also some others mentioned in the comments above. Check it out and thanks for reading! They are also edible, pick them when they are green, cut into chunks and stir fried with some garlic & salt (or soya sauce). They are really sweet and the young seeds are edible too. Great source of fibre. Great tip! I have tried them when they were very small. They were tasty! Isn’t it crazy that we all thought luffas came from the ocean? I wonder where that came from? Thanks for checking this out! Luffas are gourds; there is a gourd society in every state but there is the American Gourd Society and you can Google to find out where to buy Luffa seeds. There are gourd farms and they sell seeds. Have fun! Dang it! I wanted those seeds, but I didn’t make it in time. I never realized luffa was a plant, never really thought about where it came from at all to be honest. I definitely want to try growing some. What a cool gift for Christmas a homegrown luffa and some homemade bubble bath would make! The most unusual thing growing over here is a Japanese Quince. Shortly after we moved into our house two years ago this big bush in our yard bloomed with tons of gorgeous fuschia colored flowers. Once the fall rolled around the flowers were gone but there was a strange fruit all over the bush. I didn’t know what it was until I saw someone on Hometalk post a picture of the same bush asking the question. I’ve heard it makes great jelly, so maybe this year we’ll take a stab at that in the Fall. Thank you for sharing this post – it’s the most interesting thing I’ve read this week! Thank you so much for checking it out! I love growing luffa, it’s super interesting! I wish I had more seeds to give. I would love to get some luffa seeds. I wish I had some more! Thanks for reading! I pinned this page so I could remember I wanted to grow these. I just wanted to share with everyone looking for where to purchase that I found some on Amazon that seem like they’re a high quality and are US grown (many sellers were international,) and then I ended up finding luffa seeds at Target of all places last week! I sure wish I could have given some to everyone! We are planting them again this year, so we will have plenty to share again next time. 🙂 Thanks for reading! Where do you find luffa seeds? You could check with Park Seed online. They have had them in the past. How far north can luffas be grown? I have read several places zone 5 and warmer, but another reader said they grew them cooler by starting them inside even longer. I would try it and see what happens. Can’t hurt, right? 🙂 Thanks for asking! I’m so happy I came across this post! While rummaging through our seeds, I found some Luffa seeds and planted them! I had no idea what they could be used for, but now I know! Thanks for posting, and I look forward to experimenting with the endless possibilities for this lovely plant! I’m so glad the post is helpful for you. Thanks so much for checking it out. Hi Christina! 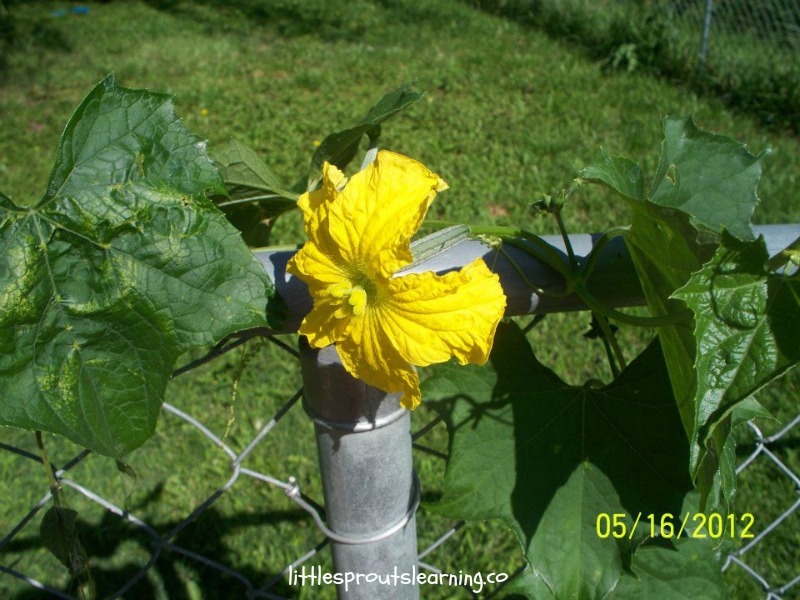 Loved the post we enjoy growing luffa’s too! 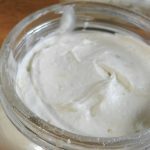 I chose your post to feature this week for the From The Farm Blog Hop! THANKS SO MUCH! How awesome! I had heard you can grow these! This is so awesome. Loofah works so well for cleaning pots and pans (and people too). Yours look great! I wish I had some sun. I’m sharing on Twitter. Mi mama plantaba en Mexico, y por mucho tiempo estuve buscando como se llamaban en inglés y por fin lo encontré vivo en Wisconsin espero y pueda crecerlos…. ¡Genial! Estoy tan contenta de escuchar esto. Usted puede obtener semillas de Park Seed o panadero Creek herencia Seeds. Le deseo mucha suerte y muchas gracias por leer! Do you know any source.for seeds. Where did you get yours initially? Someone locally gave them to me but I have seen them on park seed and someone else commented that baker creek heirloom seed has them. Thanks for reading! Wonderful post, I thought they were water born as well. Thank you so much! And thanks for reading it! I would love you sell you some but they have all been mailed out. I have seen them on park seed and heard that someone else bought them from baker creek heirloom seeds. Thanks so much for reading! Oh, and the oddest thing I have ever grow were those enormous snake gourds! oooh, enormous snake gourds sound fun. what did you do with them? I would love to give you some seeds, but they are all mailed out. But i did see them on park seed and someone mentioned getting some from baker creek heirloom seeds. I hope you get to grow some. Thanks for reading! The strangest growing adventure is starting pomegranates from seed. Will post as they start to grow. I am so excited to try and grow these. I am always looking for new things to try so thank you so much for teaching me they come from a plant. I thought they came from the sea as well! That’s funny that so many people thought that. Where did we get that info from I wonder? I hope you grow them, it’s so much fun. Thanks for reading. That is so cool! Pinning for future reference because I want to try that this year. I hope you do, it’s super cool. thanks for reading! I would love some seeds if you still have them. I just started on pinterest and an heirloom seed fb page so I can learn how to indoor and container garden. I just started a sweet potato. I have a few Orchids, of course not edible, but lovely! Sorry Marion, all the seeds are given away, but I wish you luck in growing! Orchids, cool! Did you know that sweet potato vines are edible? YOu can cook them like greens. I thought that was super cool. Thanks so much for reading! I would love to find out how/where to order some of these seeds. I rent & live where I’m pretty sure I don’t get enough sun to grow them. But my Mom lives in a sunny desert like climate & I just know she’d love this. Thank you for sharing the information, great fun! Thank you so much for reading, and I’m sorry all the seeds are gone, but I have seen them on Park Seeds for purchase if you would like to check there. How fun for your mom! Thanks again for stopping by and happy growing! Does anyone know where I can get some seeds here in SW Michigan? Have the perfect place to grow some of these and would need to start them NOW. Great article – thanks for posting. Thank you so much for reading! I saw some luffa seeds on Park Seed, so maybe you could check there. I wish I had enough for everyone! Have a great day! Oh shoot! I missed getting into the top 8, but had to comment anyway…what a great post!! I, too, thought luffas came from the ocean (where did that come from, I wonder?) 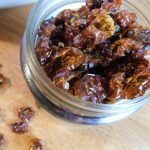 I’m super excited to try this, and it’s given me some great new ideas for homemade items to sell at our local farmers market. Thanks for the info! I don’t know why in the world we thought that? I wish I could send you some seeds anyway, but i’m out. I did see them on the Park Seed website. Good luck on your growing. And thank you so much for reading. So cool! Thank you for sharing! Yep, I was amazed too. Good luck in growing. And I saw the seeds available on park seed if you are looking for a place to purchase them. I wish I could send some to everyone. Thank you so much for reading. I can’t believe their are so many uses for them! I would love to get some started! We grew dragon beans last year. They were crazy and the kids loved eating purple “green” beans! Do you know where I can get some seeds? I saw luffa seeds in park seed. Luffas are crazy useful. I was amazed to learn all about them too. We bought some seeds for dragon beans this year, i’m excited to start them in a few months. thank you so much for reading. Maybe not super unusual, but I enjoyed growing valerian one year and then making a tincture from the roots. Great for relaxation and sleep! wow, I’ve never even heard of valerian. That’s super cool. Sorry, all the seeds are given away, I wish I could send some to everyone. 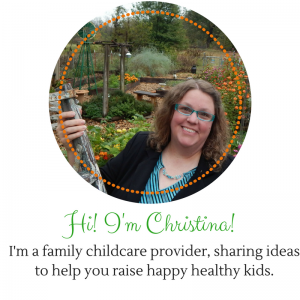 Thanks so much for checking out my post and happy growing! I love this!! I never knew you could grow luffa sponges. This is very cool and I want to grow some this Spring. Would love to know where to get the seeds. Thanks for sharing. Be watching your email for a message from me to get your address and send your seeds. Thanks so much for reading! I just started apartment container gardening last year, so I don’t have a lot of strange plant experience, but I got okra to come up very successfully in a pot. Okra in a pot is AWESOME! We love okra! Be watching your email for a message from me to get your address and send your seeds. Thanks so much for reading! I wish I had a strange thing to grow! This looks so interesting! Well now you will. 🙂 Be watching your email for a message from me to get your address and send your seeds. Thanks so much for reading! the most unusual thing we have grown thus far is lovage, but I am excited to expand our garden experience, my little bits just love growing things! Our growth experiment this year is going to be water chestnuts- so excited! we planted lovage last year, we had some trouble, but finally got it going. what did you think of the flavor? What have you used it for? water chestnuts, neat. We are going to grow peanuts. Be watching your email for a message from me to get your address and send your seeds. Thanks so much for reading! What an amazing idea! I can’t wait to share this with my 4-H kids!!! Where can you get seeds to start? very cool! I’m amazed at how these are made! Most unusual thing is probably pepper plants in pots. Not hard but it was convenient when I needed one for cooking it was right there. They grew back quick too. Hi Cristina ! Thanks so much for all the information that you provided about loffas , for years I’ve been trying to find out if I can grow them here in Michigan . We migrated from lebanon in the 80s and my grandparents used to grow them to use as sponges for bathing . We have ‘walking onions’, and they are really prolific. I really don’t need to grow regular green onions with those in the garden! cool, we planted those this fall. I’m excited to see how that turns out. Be watching your email for a message from me to get your address and send your seeds. Thanks so much for reading! I have looked for those onions for years, where can I buy them? If you’re talking about the luffa seeds, I have seen them on park seed and have see others post they got some from baker creek heirloom seeds. Thanks so much for reading!